To celebrate my BIG blog makeover, I'm hosting a giveaway! My new design by the amazing Alexis at Laugh Eat Learn makes me sooo happy! So, I want to share that happiness with all of your! The giveaway will feature items that make me happy! Giveaway ends Friday! So get entering! 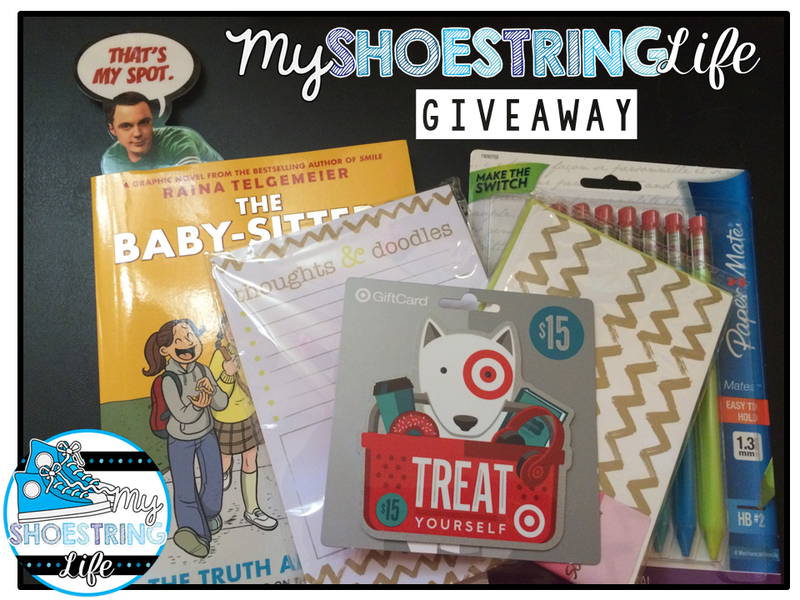 Enter to win a $15 Target gift card, The Baby-Sitters Club graphic novel, notepad, thank you notes, my favorite mechanical pencils, and a Dr. Sheldon Cooper bookmark! Love your new blog design. Weekends make me happy! Super cute blog design!! Love it! Love PaperMate flair pens in bright colors! I love the new look! My favorite things are also flair pens!! Love your blog! I hope I win. My favorite place is TARGET! I also love post its. Ha! Cool! And looks like those stuff never been in use) So, you basically bought it and giving it away? It looks very personal to not just give away your money but things you bought yourself. Like sharing your style. My style is to share things I like, so everyone would have an access to my source of pleasure in the amount they want. So, here goes https://theseteens.com/. Enjoy! Appreciate it in this particular tremendously splendid blog! Almost everyone entirely worth one’s own website online blog post. Some of us get some good brain it great websites it’s around world-wide-web blog site. At this moment push these follow-up Cash Advance Spring-Valley Through bless you on the topic of shape info. Teacher Trick for Ghoulish Behavior!